It turns out there’s a reason why this handy new trailer-sailing pocket cruiser, with its hard-chined hull and jaunty appearance, is vaguely reminiscent of the old West Wight Potter. It seems boatbuilder Ken Lange was devoted to the old Potter and ran the company that builds the boats, International Marine, before getting turfed out of the business by a Chinese investment group. In looking for a new project he soon found Argentine designer Heraldo Ruesch, who had just developed a new boat—he called it the Ruesch 5.5—that tugged at Ken’s heart. A deal was struck, the boat was renamed after a popular Argentine wine, and production commenced in California. The first two boats that popped out of the mold, curiously, were given away as prizes on The Price Is Right. I will say this new boat looks much sleeker and more attractive than the old 15ft Potter. With a relatively fine bow, a high-aspect fractional rig and a neatly sculpted cabinhouse, it reads as a considerably more modern boat. Still, it is a simple one. Construction is straightforward: both deck and hull are hand-laid solid laminate with a few dabs of lead ballast set in the hull forward and in the centerboard to help keep things upright. The interior is utilitarian, taken up primarily with a V-berth and a pair of long settee berths, with room left over for an ice chest, a small chemical toilet and a one-burner Jetboil swing stove. I sailed the boat with Ken in pleasant, unchallenging conditions on Chesapeake Bay off Annapolis. The true wind was blowing just 3-7 knots, and we could have made good use of the optional genoa (98ft2) or the optional asymmetric spinnaker (120ft2). Instead, we had just the mainsail and a standard working jib (55ft2), but still we managed well enough. 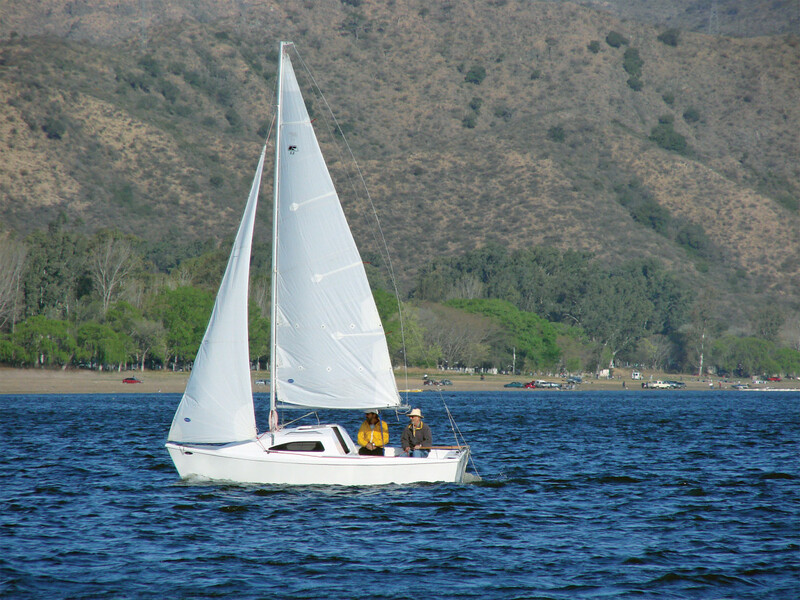 The boat made up to 3.5 knots of speed sailing close-hauled at a 40-degree apparent wind angle and sometimes touched 5 when we cracked off to a close reach. Even when bearing away, first to a broad reach and then dead downwind (sailing wind-and-wing with Ken’s extended arm playing the role of a whisker pole) we always kept moving at 2 knots. There was very good helm feel throughout, so the boat was rewarding to sail, even in light air flying less canvas than we would have liked. I did note the mainsail had two sets of reef points. I suspect the boat, with its relatively flat bottom, will plane readily in strong conditions. The Malbec comes standard with an aluminum rig from U.S. Spars and deck hardware from Ronstan. For ventilation below, there is a foredeck hatch from Bomar. The sail controls are quite simple, with a boom vang but no mainsheet traveler. 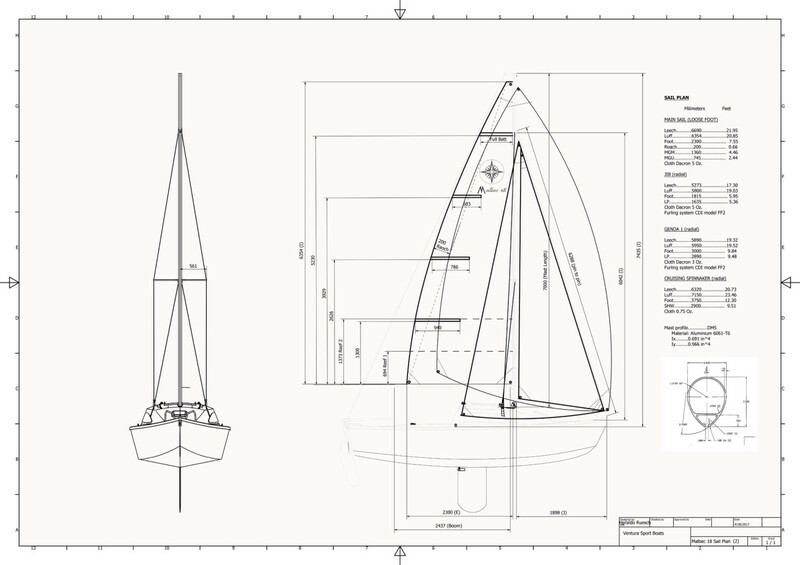 I found the mainsheet and centerboard controls were easy to reach from the helm, and though the jib sheets will require a singlehander to stretch a bit, only those with truly short arms will find this challenging. Our test boat was also equipped with a unique raised stainless steel grabrail around the cockpit. As freeboard on the boat is fairly low, some will find this provides a sense of added security, particularly when the wind is up. I found it also serves admirably as a backrest. All up the Malbec weighs just 1,500lb and does not require a heavy trailer when on the road. I expect most automobiles will be able to tow the boat without any trouble. As for auxiliary power, we ran our test boat with a 2.5hp propane-fueled Lehr outboard, which I thought worked very well, although those expecting to motor long distances may want to invest in a larger gas-fueled engine.